Cacao powder is from cacao beans. 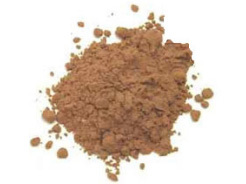 But we cannot ground the Cacao beans or Cacao nibs to obtain the Cacao powder. Actually, it is got through the process of extracting the Cacao butter from the Cacao bean. The fine powder appears when we dry the residue and grind it. It is certain that chocolate is also made from Cacao beans. The dark brown cacao powder tastes a little bitter when we eat as it is. But when we put it into the desserts, cakes and biscuits, it has a nice chocolate flavour. Cacao powder can be used alone or along with pieces of cooking chocolate to bring a rich chocolate flavour to cooking. The chocolate crepes, muffins, cakes, biscuits, icings and toppings are all made from cacao powder. Remember to place it in a cool and dry place and be attention to the manufacturer's use-by date.